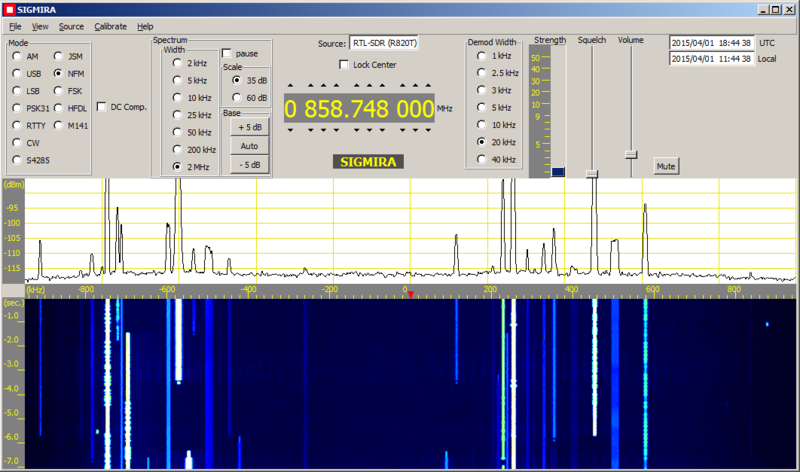 Sigmira is a Software Defined Radio (SDR) application program that runs on Windows. It operates with with an external conventional receiver, RFSpace SDR-IQ, RFSpace SDR-14, RTL-SDR, SDRplay RSP, or SDR-RADIO.com networked receiver. Sigmira offers wideband spectrographic, waterfall, and phase plane displays. It also demodulates various military, utility, and "ham" radio signals. "Waterfall" and spectrograph displays of up to 200 kHz width with the SDR-IQ/SDR-14. Display up to 2 MHz width with the RTL-SDR. Demodulation of HFDL, PSK31, FSK, SITOR-B, CW, and NFM modes. Demodulation of NATO STANAG 4285. Demodulation of the "Japanese Navy Slot Machine"
Point and click signal selection/tuning. Signal Database with automated tuning and logging. Playback of saved .wav files. 16 bit sampling. Typical sampling rate: 48 ksps. Clock display with UTC and local time. The distribution package includes examples of HFDL, PSK31, RTTY, FSK, SITOR-B, CW, NFM, JSM, and STANAG 4285 signals in .wav files. A database of over two thousand signals is also included in the distribution package. Sigmira has been combined with XDFilt in the "sigtools" installer. A new version of Sigmira is available. It supports the SDRplay RSP. The new version is version 1r10. It is contained in the sigtools_1r14_installer. The download link is above. New version supports SDRplay RSP. Sigmira's maximum spectrum display width is still 2 MHz for now. In the AM broadcast band I typically run with the gain at about one quarter on the RF Gain control scale. In quieter areas of the spectrum I run with the RF gain set at about the midpoint. If the gain is too high there will be intermodulation of the signals and more artifacts. If you see that back the gain down. Also, if the plot in the Phase Plane display appears to have a clipped, square outer boundary then reduce the RF gain. Sigmira_1r10 is included in Sigtools_1r14. The new version can be installed without removing the older one. The desktop shortcuts will point to the last one installed. If you remove the older version and have edited or customized your signal database be sure to make a backup copy of your "sigmira.sdb" file before removing the old version. Sigmira is a trademark of Steven A. Harlow.